On Tuesday 20thNovember, we welcomed Dr Brian Klaas, Assistant Professor of Global Politics at University College London and a weekly columnist for The Washington Post; and Dr Karin von Hippel, Director-General of the Royal United Services Institute (RUSI) to GSF. 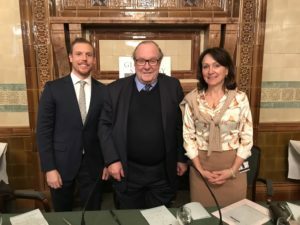 They spoke in a discussion entitled ‘Two Years’ In: Trump And The Global Order – The Trajectory Of American Foreign Policy?’, which was chaired by Lord Lothian. To listen to the discussion again, please click here.